Beach. Pool. Sun. Hot. Thirsty. Stir together flour, baking soda, baking powder and salt. Set aside. Using the paddle attachment, put butter and zest in mixing bowl and beat until smooth. Add oil and mix, then add sugar and blend in. Add eggs, scraping sides occasionally, and mix, followed by vanilla and lemon juice. Add dry ingredients until just combined. Batter will be very loose. Refrigerate for several hours or overnight. Preheat oven to 350 degrees. Line baking sheets with parchment. Roll tablespoon sized scoops of dough into round balls, roll in turbinado sugar, and place on baking sheet. Leave a good amount of space between them since they will spread. Bake for about 8-10 minutes, or until cookies are just firm. Bottoms will be pale brown but tops will be light. This entry was posted in cookies, dessert, lemon. Bookmark the permalink. I am a sucker for lemony desserts. These cookies sound wonderful. YUM! Give me a lemon-anything and I’m a happy girl! These look delish! 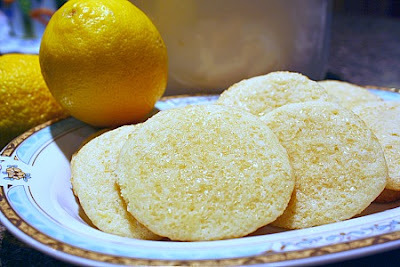 I love how soft and refreshing these cookies are, just like a tall glass of lemonade. A little something different from the usual sugar cookie. Yours look delicious! God I want lemon dessert so bad. Now I want cookies! These look yum! Lemon always makes me think of summer. These cookies look great! These sound perfect for summer!!! I love lemon cookies. These sound great!